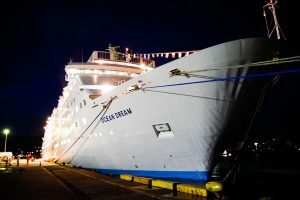 Today the Ocean Dream arrived in its final port of call, the capital of Samoa, Apia. 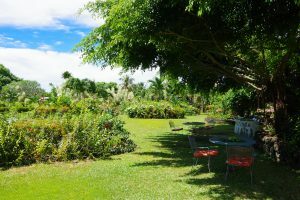 Located in the beautiful South Pacific Ocean 1200km south of the Equator, Apia is on the island of Upolu and sits next to the island of Savai’i, both of which were formed as volcanic islands. 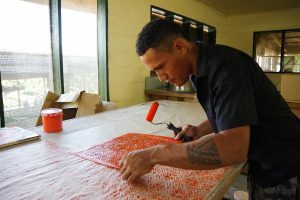 A further 100km to the east lies the island of Tutuila, which forms the heart of American Samoa, a US territory turned into a completely monetary society through American investment. This lies in stark contrast to the west which still retains and protects its traditional Polynesian traditions and rituals. 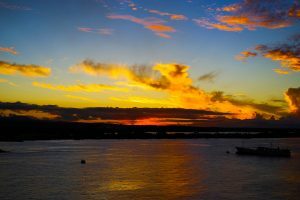 Arriving in the low light of the early morning, the ship was welcomed into its final port with a beautiful welcome dance. 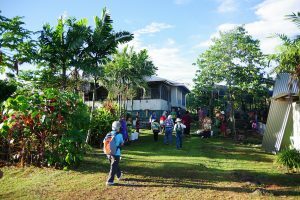 Today we had the opportunity to participate in Optional Tour “Meet Samoan Women aiming for Independence”, visting our counterpartner Women in Business Development (WIBDI), which aims to improve the standing of women in society and increase their income through organic agriculture and fairtrade. We had the opportunity to visit their offices, farms and factory, and to learn about sustainable agriculture. 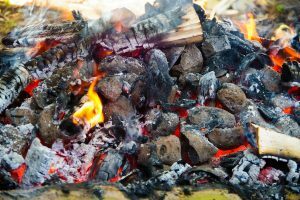 Upon arriving at the WIBDI offices in the village of Nuu, the heady aroma of charcoal fire hung in the air, and we were treated to the opportunity to try food prepared in an Umu. 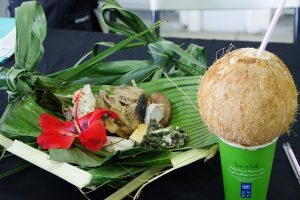 The Umu is a traditional form of Samoan cooking where firewood is burned and stones heated to a high temperature, then various foods such as taro, banana, fish, chicken and game is wrapped in banana leaves and placed amongst the stones to cook. 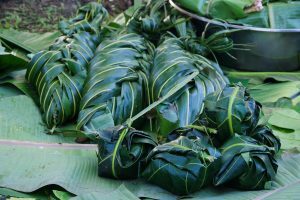 Many banana leaves are then placed on top and everything is left for an hour to cook. We also had the opportunity to see where coconut oil and soap was being made. 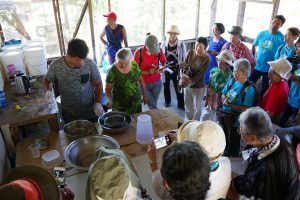 One WIBDI member told us that “three years ago we learned how to make soap from a Japanese woman visiting Samoa, and since then we’ve been able to make a business from selling our own soap”. Many other similar projects have since also sprung into being, with the number of working women now on the increase. This work employs not just women, but men as well, with some men working next to the factory carefully putting together soap packages. The factory aims not to produce large volumes of product, but rather carefully considered products made with care that are good to the environment. 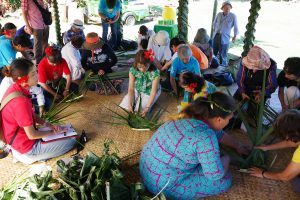 In Samoa people sit and make plates from coconut leaves whilst they wait for the umu to finish cooking, and in this way share music and dance passing on tradition from one generation to the next. This beautifully atmosphere brought peace to the heart of all participants. 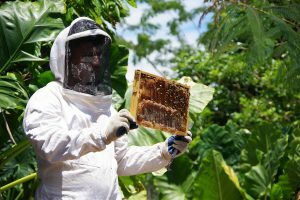 Next up was the recently started honey project, using organic agriculture to grow flowers used to produce delicious honey. Many of the projects focused on creating products that did not result in increased burden on the surrounding environment. 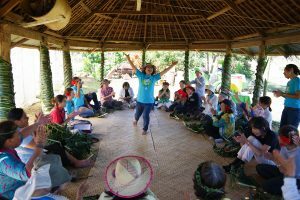 We then had the opportunity to visit the farm of Gina, who works in partnership with WIBDI. Managing such a large farm with no pesticides is no easy task, but she does so with the help of her family to care for and protect the land. We also then could sample some of the delicious fruit grown on her land. Though hard to leave, the time then came to leave our final port of call. As the ship made its way out of the harbour, many memories of our journey up until now come to mind, along with a few tears. The Ocean Dream will soon return to where it set out from 100 days prior. Having traveled around the southern hemisphere through Asia, Africa, South America and Polynesia, we made our way around this wide, wide world. This journey without borders will soon come to an end, but the countless memories, bubbling emotions and unforgettable friends will remain in our hearts. We press on to Yokohama, with each moment of our travels engraved in our hearts.